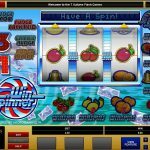 Win Spinner is a classic slot coming from Microgaming software. This is one of the older slots coming from this provider which were quite popular in the past. 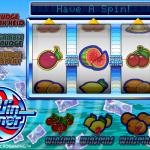 Still Win Spinner has a few more extra features which bring it one step closer to a video slot game. This is one of the few classic slots which actually have a bonus round and extra bonus features. Despite the classic design the slot has a soothing choice of colors and attractive symbols. The few flashing animations in the game give it a Vegas look just like the real live slot machines found in land based casinos. There are no payouts to be earned during base play in Win Spinner. As you land winning combinations on the single pay line you earn Win Spins. You can accumulate up to a total of 25 Win Spins during regular play. The Wins Spins are played on 5 reels and 5 pay lines with different symbols and payouts. You can win up to a maximum of 500 x stake per pay line in a single spin during any Win Spin in the game. During the Win Spins you can also trigger the Shifta Feature, where one reel is held and the rest of the reels are nudged until winning combinations are formed. You can also trigger the Let’em Spin feature when two matching symbols land on a pay line. The rest of the reels will spin until a winning combination is formed. 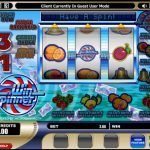 Win Spinner is an interesting slot game despite the overall vintage design. Many classic slots use the Win Spins design, but not too many have extra features like this Microgaming slot. Players can win up to 500 x stake per pay line in any Win Spin which is reason enough to try the game for real play. If you are a fan of classic slots then you should consider playing Joker 8000 a 3 reel slot by MicroGaming.